Mahindra Bolero is one of the rugged sports utility vehicle from the home grown manufacturer, Mahindra and Mahindra. 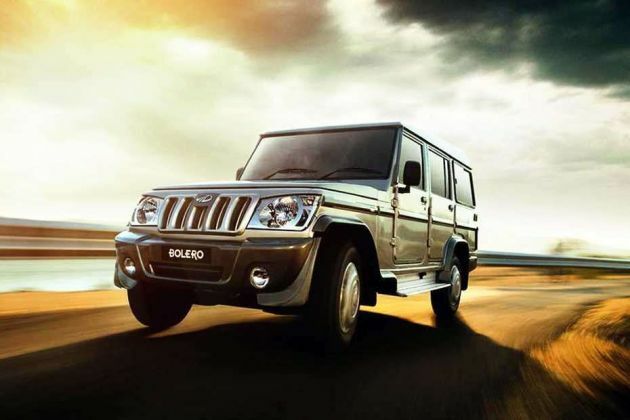 The company is selling this variant in numerous trim levels, out of which, Mahindra Bolero ZLX is the top end variant. It is equipped with a 2.5-litre m2DiCR diesel engine, which comes with a displacement capacity of 2523cc. This diesel mill can churn out a maximum power output of 62.1bhp in combination with 195Nm of peak torque. It is incorporated with a common rail based direct injection fuel supply system, which can deliver a decent mileage. When it is driven on the highways, it gives close to 15.96 Kmpl. While in the city limits, this SUV has the ability to generate 12.4 Kmpl, because of traffic conditions. On the other hand, its internal cabin is incorporated with voice messaging system, rear wash and wipe function, power windows and many other utility based aspects. When it comes to outside measurements of this stylish vehicle, it measures 4107mm in overall length along with a decent height of 1880mm. The total width is about 1745mm, which includes external rear view mirrors. It also has a minimum ground clearance of 180mm and a large wheelbase is 2680mm, which ensures comfortable seating with enough leg room. This sports utility vehicle is designed with quite a few features, which gives it a striking look. To begin with the frontage, it comes with a massive radiator grille that is fitted with body colored slats and a prominent company logo in the center. This grille is flanked by a well designed headlight cluster that is equipped with bright halogen lamps and turn indicator. The body colored bumper has a wide air dam for better air intake and it is flanked by a couple of fog lamps as well. The large windscreen is made of toughened glass and integrated with a set of intermittent wipers. The side profile is designed with stylish body graphics, which gives it an eye catching look . The neatly carved wheel arches are fitted with a set of 15 inch steel wheels, which are covered with full wheel caps. These steel rims are further covered with 215/75 R15 sized tubeless radial tyres, which ensure a superior grip on any road condition. The door handles and outside rear view mirrors are painted in body color. These ORVMs are electrically adjustable and integrated with side turn blinker. On the other hand, the rear end is fitted with a body colored bumper, which has a pair of reflectors, a radiant tail light cluster and a large windscreen as well. Apart from these, it also has a full size spare wheel with body colored cover, which is affixed at the tail gate. The internal section has enough room for a minimum of seven passengers and is incorporated with wide seats, which are covered with fabric upholstery. The wood finished dashboard is equipped with a driver information system, that has a digital clock, tachometer, electronic trip meter, digital odometer, door ajar warning and driver seat belt reminder notification. The wood finished dashboard is equipped with AC vents, a big glove box and a three spoke steering wheel. This variant is incorporated with some practical features that includes front seat back pockets, cup and bottle holders, map pockets and utility space in front doors, a 12V accessory outlet and a center armrest on second row seats as well. Apart from these, this variant is also bestowed with a remote fuel lid opener, body colored inside door handles, keyless entry and wood finished center console as well. This Mahindra Bolero ZLX trim is fitted with a 2.5-litre diesel engine with micro hybrid system, which comes with a displacement capacity of 2523cc. It is integrated with four cylinders and eight valves using SOHC valve configuration. It has the ability to produce 62.1bhp at 3200rpm in combination with 195Nm between 1400 to 2200rpm. It is mated with a five speed manual transmission gear box, which transmits the engine power to its front wheels. This diesel mill in incorporated with a common rail based direct injection fuel supply system, which allows the SUV to generate 15.6 Kmpl on the highways. At the same time, it can generate close to 12.4 Kmpl in the city limits. It can attain a top speed in the range of 120 to 130 Kmph and it has the ability to cross the speed barrier of 100 Kmph in close to 25.6 seconds. The car manufacturer has given this SUV an efficient braking mechanism. The front wheels are equipped with a set of disc brakes, while the rear wheels are assembled with solid drum brakes. On the other hand, the front axle is fitted with an independent suspension mechanism, which is further assisted by coil spring and anti roll bar for keeping it well balanced. The rear axle is equipped with an elliptical leaf spring type of mechanism as well. The rack and pinion based power steering system is tilt adjustable and it supports a minimum turning radius of 5.8 meters. This Mahindra Bolero ZLX is the top end trim and the company has bestowed it with a number of features. Some of these aspects are a power assisted steering wheel with tilt adjustable function, all four power windows with switches on center console, remote fuel lid opener, front map pockets, voice messaging system and many other such things. Apart from these, it also has an efficient air conditioning system with a heater and a music system with a few features, which enhance the ambiance of the entire cabin. The list of safety aspects that are available in this variant are an advanced engine immobilizer and central locking system along with child safety locks for rear doors . Then it also has seat belts for all occupants, which further enhances the safety in case of any untoward collision. All these and a few other such aspects will keep the occupants and the vehicle safe on any road conditions. 1. Spacious internal cabin with ample leg and shoulder room. 1. Fuel economy is disappointing as compared to its competitors.